An analysis funded by the National Eye Institute (NEI), part of the National Institutes of Health, has identified three genes that contribute to the most common type of glaucoma. The study increases the total number of such genes to 15. "Just in time for Glaucoma Awareness Month, this unprecedented analysis provides the most comprehensive genetic profile of glaucoma to date," said NEI Director Paul A. Sieving, M.D., Ph.D. "These findings open avenues for the pursuit of new strategies to screen for, prevent, and treat glaucoma." Glaucoma is a group of conditions that damage the optic nerve, the bundle of nerve fibers connecting the eye to the brain. Primary open angle glaucoma, the most common type, was studied in this analysis. In the majority of cases, pressure inside the eye is increased. Glaucoma affects side vision first, often going unnoticed for years. If detected early, vision loss can often be prevented with surgery or eye drops to lower pressure. The most common culprit of irreversible vision loss, glaucoma affects about 2.7 million Americans and 60 million people worldwide. Some rare types of glaucoma are inherited via a single gene. The underlying causes of primary open angle glaucoma remain poorly understood, but likely involve the interaction of many genes with environmental influences. The researchers compared the DNA of 3,853 people of European ancestry with primary open-angle glaucoma to a similar group of 33,480 people without it. Data for the analysis came from eight datasets generated by members of the NEIGHBORHOOD Consortium. NEIGHBORHOOD stands for NEI Glaucoma Human Genetics Collaboration Heritable Overall Operational Database. To ensure uniformity among the datasets, the researchers restricted their analysis to gene variants included in the 1000 Genomes Project reference panel–a catalog of human genetic variability. The analysis showed that specific variations in the genes FOXC1, TXNRD2, and ATXN2 are associated with glaucoma. Additional analyses of datasets from Europe, Australia/New Zealand, and Singapore also found associations between glaucoma and these gene variants. All three genes are expressed in the eye. TXNRD2 and ATXN2 are active in the optic nerve. The TXNRD2 gene makes an enzyme that protects mitochondria against oxidative stress–the build-up of toxic byproducts from normal metabolism. Mitochondria are energy-producing cellular components. For years, scientists have suspected that oxidative stress might contribute to the degeneration of the optic nerve, but until now they lacked evidence. "This is the first direct report to show the association of a gene linking oxidative damage to glaucoma," said Neeraj Agarwal, Ph.D., a program director at NEI. The study suggests that people with TXNRD2 gene variants may have a reduced ability to protect mitochondria from damage, leading to optic nerve cell death. Little is known about the normal function of ATXN2. Mutations of the gene are implicated in a rare disorder called spinocerebellar ataxia 2 that causes loss of balance and coordination. Interestingly, ATXN2 is the third gene associated with both glaucoma and amyotrophic lateral sclerosis (ALS), also known as Lou Gehrig's disease. However, there is no evidence that people with glaucoma are at greater risk of developing ALS. "Connecting these genes to glaucoma was possible only through close collaboration among NEIGHBORHOOD investigators," said Janey Wiggs, M.D., Ph.D., associate director of the Ocular Genomics Institute at the Massachusetts Eye and Ear Infirmary, part of Harvard Medical School. Dr. Wiggs is the principal investigator for NEIGHBORHOOD and lead author of the report, which appears online today in Nature Genetics. NEI support for the study was funded through grant EY022305. The NEIGHBORHOOD Consortium includes collaborators from 22 institutions. More information about NEIHBORHOOD, including a list of collaborating institutions, is available at http://www.glaucomagenetics.org. 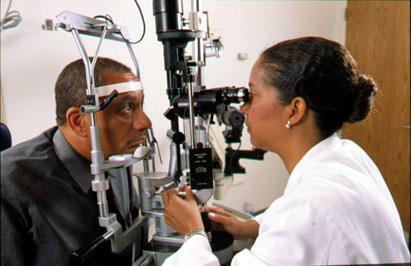 For more information about glaucoma, visit https://nei.nih.gov/health/glaucoma. The NEI National Eye Health Education Program (NEHEP) provides a variety of educational resources, in English and Spanish, as part of its broad eye health outreach effort. To find educational resources available from NEHEP to use during Glaucoma Awareness Month this January and beyond, visit https://nei.nih.gov/nehep/GAM.